KitchenWise - Page 3 of 394 - Smart Systems for Sanity in the Kitchen. It’s time for breakfast (again) and the kids are tired of eggs. You wanna say yes, but you know you need protein to build bodies and fuel brains, so you decide to make muffins and eggs (comfort food + protein). But then suddenly breakfast is this huge production that doesn’t fit on a weekday morning, and there’s scrambled egg fragments all over the kitchen that no one wants to eat the eggs anyway because MUFFINS! just came out of the oven! Solution? Put the eggs in the muffins. All the eggs. But wait. You’ve tried some of those “healthy” eggy creations in the name protein, and they were awful. Worse than cold scrambled eggs. The kids couldn’t gag them down, and you wasted an entire carton of expensive farm-fresh eggs, and the dog won’t even eat them. That’s because if you wanna use a lot of eggs in your baked goods, you have to balance them out with other ingredients that bring moisture and texture. 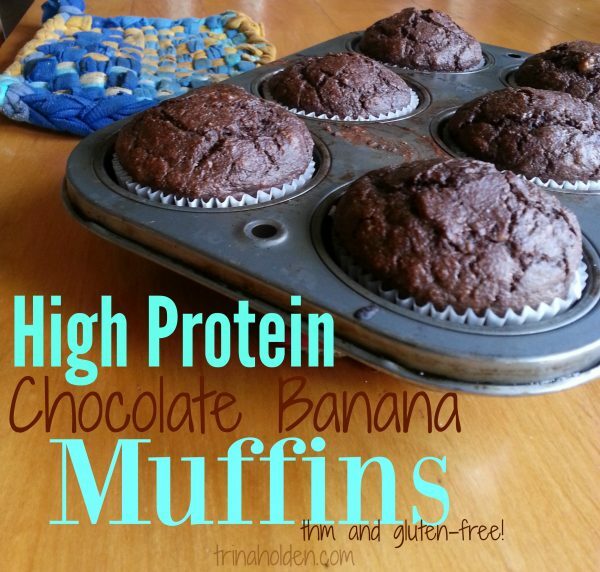 Upping the protein in my baked goods has been a strategy I’ve learned from the gals at Trim Healthy Mama. Their newest cookbook is gorgeous and my kids and I love paging through and finding new dishes to make. If you’re looking to up the nutrition in your family, this book would be a great tool. This muffin recipe is a variation on their Chocolate Banana Muffins on page 181. My version would be considered a “Crossover” because I use full fat yogurt, whole eggs, and we enjoy them with lots of butter because that’s what muffins are, right? Simply #buttervehicles. Amen. this recipe makes 2 doz. large muffins. Go ahead, it's kitchenwise to bake in bulk. They will disappear within 24 hours, or you can freeze half for another day! Grease 24 muffin tins (I use coconut oil) and line with paper liners. Peel and mash bananas in the bottom of a large bowl. Add eggs, yogurt, and vanilla and mix well. Pour oat flour on top of the egg mixture, and measure the rest of the dry ingredients on top of that. Mix the dry ingredients together a bit, then fold them into the wet stuff in the bottom of the bowl. Divide batter into muffin tins. If you have extra, you can pour it into a bread pan and make a loaf for snacking later. Muffins tins are the worst dish to clean! Save time and angst–get muffin tin liners. And, let me save you even more angst: avoid the cheap ones that stick to the muffins and get yourself some nice, parchment paper liners! They work so well, you can literally lift the finished muffins clean out and use the papers again! Putting liners into muffin cups is a GREAT job for toddlers who are otherwise going bananas waiting for breakfast to be ready. Ask me how I know. Smart cooks bake in bulk. I have two large dozen count muffin tins like these. I could really use a third. My method of mixing muffin batter only requires one bowl by measuring the dry ingredients right on top of the wet. As soon you get the muffins in the oven, turn around and wash one bowl, and breakfast clean up is over. These muffins are a complete meal in themselves and are not very crumbly thanks to all the eggs, so you don’t even need to serve them on plates. You can get right to the rest of your day. You’re welcome. Morning Glory Muffins–Omit the cocoa powder and add 8 drops orange essential for a flavor burst (Use pure, oils certified for cooking!) and 3/4 cup raisins. Pumpkin Spice Muffins–Replace banana with equal amount of canned pumpkin OR leftover mashed squash. 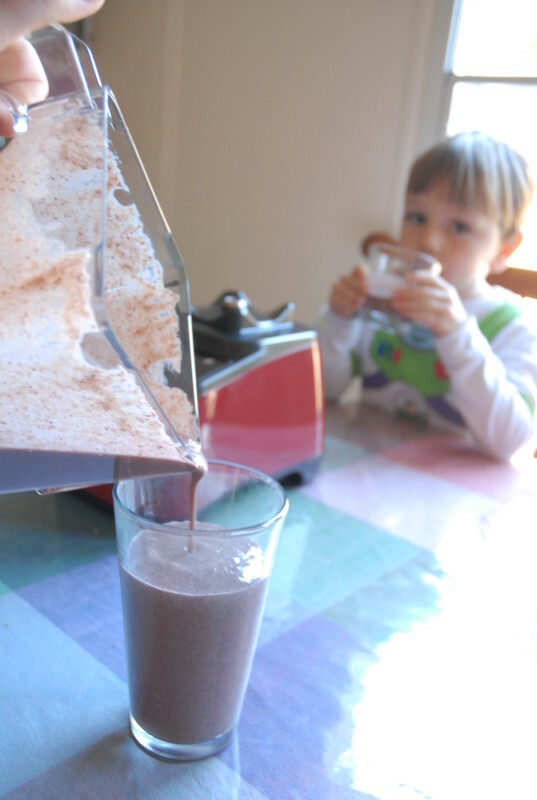 Replace the cocoa powder with 1 Tbsp. pumpkin pie spice. Banana Split Muffins–Add 1/2 cup peanut butter and top the muffins with a sprinkle of mini chocolate chips. Mmmm….great birthday breakfast! Do your kids like eggs? Do you have to hide them? Tell me your family’s favorite high protein breakfast in the comments! Do you wish you had something a little more tasty plain water–but not too high in sugar–to get you through morning errands, or the witching hour? I whip this up nearly every day for myself, and I’ve perfected it so I can do it in 30 seconds–so even if I’m late getting out the door, I can still fit in this tiny bit of all-important hydration and mama self care. And the weirdest thing happened once I’d made this a habit…my craving for chocolate just walked away and left me. This is bittersweet (get it?) because I still love the idea of chocolate in my head, but the caffeine and sugar have never loved me. My health mentor told me it was because my Power Drink was helping me absorb minerals and balance my gut so I was getting the calcium and magnesium that my body was asking for when it craved chocolate. It all got a little to scientific for me, all I know is when I’m drinking this stuff, I feel great, and it tastes great. That’s enough for this mama. I’ll let you decide if you want to use this as an excuse to break up with chocolate. This recipe nicely flavors my favorite 22 oz. glass water bottle, you can up the amounts a little to make this in a quart jar! Throw all the ingredients straight into your glass jar or bottle. Swirl a little to mix, add ice to the top, then add water to fill. Shake thoroughly to spread the goodness around. Then drink it up. I keep ginger in a small spice shaker so I can just ‘shake, shake’ it right into my bottle without measuring. Same thing with the salt. And I store all the ingredients right in the same cupboard right by my sink so I can literally make it in seconds. Be sure to use a glass container whenever drinking essential oils. I love my purple Lifefactory bottle and Lime Vitality Oil is my absolute favorite in this drink. The flavors remind me of Sprite. Wanna save money and make your own Kombucha? I’d love to teach you! My ecourse, Kombucha Made Easy, walks you through step by step–doors open a few times a year —be the first to hear when it opens by signing up here! Now it’s your turn–what crazy healthy thing do you put in your coffee, or tea, or how do you make sure you get good stuff in without gagging? hello!–it costs an arm and a leg at the store! But no sooner do you start researching how to make kombucha, then you get a google’s worth of recipes and instructions and come to the terrifying conclusion: everyone does it different! How do you figure out which system will work for you? What set up can you afford, which will get you the flavor you want, what style will help you fit kombucha into your busy life? 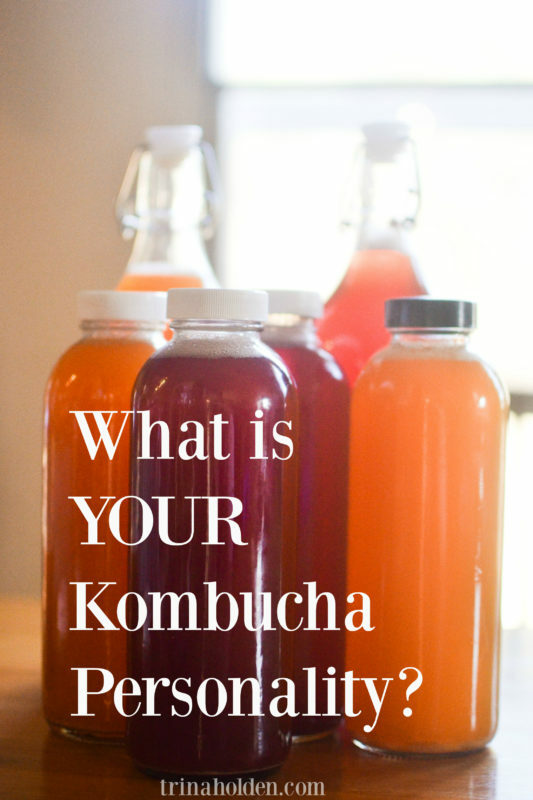 This post will help you understand the two main styles of kombucha brewing, and help you figure out which is right for you. First, an intro to kombucha is in order. starter liquid, which is leftover tea from the last mature batch of kombucha. Every time you make a batch of kombucha, it involves making a new batch of tea and combining it with the SCOBY and starter liquid. And each time you make a batch, another layer of SCOBY grows in your brew. Now we can explain the two different brewing styles. Continuous Brew is done in a glass or ceramic container with a spigot at the base so you can draw off finished kombucha from the bottom, and pour fresh tea to feed the SCOBY into the top. The containers are 1 to 5 gallons in size, and the SCOBY lives undisturbed in the brewing vessel for months at a time. The main advantage with a continuous brew container is how simple and quick it is to pour off the finished kombucha straight from the brew container. The disadvantages are that 1) you have to buy a special container–before you even know if you like kombucha or enjoy the process of making it yourself. The container must be ceramic or glass, and have a plastic (not metallic) spigot and they range from $15 to $50. 2) Every few months you have to completely empty and clean it out so trim your SCOBY down, and this is a bit of a chore. Also, occasionally the spigot gets clogged with small bits of SCOBY and that also means an complete empty and clean. I’ve had to do this twice in the last two months with mine, making me realize that it’s not quite as convenient as I thought. Batch Brewing is usually done in large glass jars or bowl and each time you make a new batch, you transfer the SCOBY and some starter liquid to a fresh, clean jar. The jars are usually 1/2 to 3 gallons, and the SCOBY is handled every week to 10 days. The main advantage is that you don’t need any special equipment to get started–most people have a glass bowl or jar that is big enough so there is no upfront cost. Batch brewing means you simply start over each time you make a new batch–transferring your SCOBY to a bowl or jar while you prepare the new batch of tea in your brewing container. What some people don’t like about the batch brew method is that they have to handle the SCOBY every time they make a batch. The final difference between Continuous Brew and Batch Brew is timing. With continuous brew, the kombucha tends to ferment faster, because you start out with a larger amount of starter tea, and the window of time in which the kombucha is ‘just right’ and ready for bottling is smaller. If you miss bottling day because you’re busy, your kombucha may be over-ripe, too vinegar-y and you may have to dump that week’s brew and start over. With batch brewing, the kombucha matures more slowly, giving you a wider window in which to bottle. In other words, if you miss bottling day by a day, or two, or even three days!–the kombucha will still be good, patiently waiting for you to get around to it. My batch brew kombucha is usually ready by the 9th day of fermenting, but I’ve let it go 14 days and it’s still tasty. If you’re curious about kombucha and just want to try it without spending money on special equipment, start with the batch brew method. If you’re the spontaneous type and don’t want to be tied down to a strict bottling schedule, batch brewing will fit your lifestyle. If you like having the right tool for the job, and don’t mind spending money upfront on a new hobby, you’ll probably enjoy a continuous brew set up. If you can picture yourself faithfully bottling your kombucha the same day every week without fail, continuous brew is your thing. I learned to brew kombucha by the batch method, and had my system down to a science. Then I got curious as to why someone would need any special equipment for brewing because it seemed like such a simple process to me. A friend of mine had a continuous brew crock (she had quit brewing because she couldn’t seem to fit it into her lifestyle) and she offered to let me try it out. I was a little intimidated by the size and where to put a 3 gallon crock in my kitchen, but I gave it a try to compare it to my batch brewing. It makes wonderful booch, and I love the simplicity of just filling my kombucha bottles from the spigot. But I don’t like that if I miss bottling day, I have to dump it. Last month life got crazy and I neglected my booch for a few days. By the time I got around to checking on my crock, it was way past edible and I had to dump 2 gallons of booch. This has happened several times to me, and I realize it’s just my personality and season of life. With 5 children, I can’t handle something in my life that requires a strict schedule! 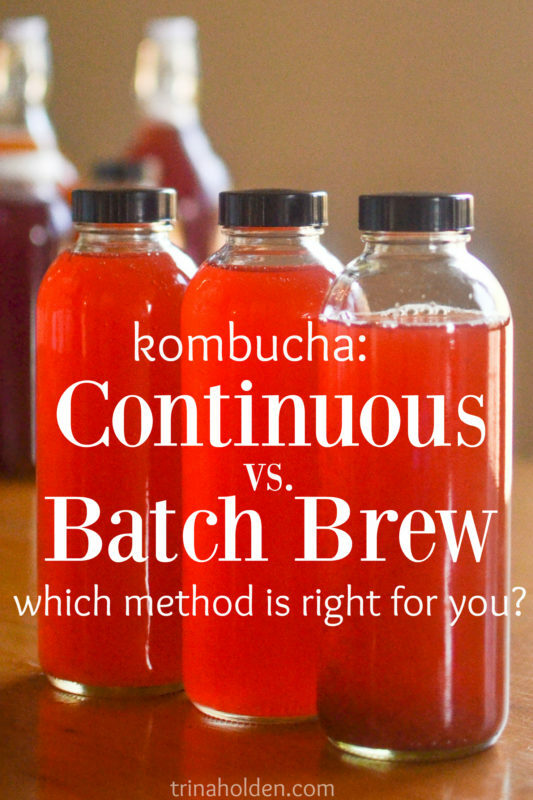 I’m using both methods right now because there are advantages to both (and I’m a crazy booch fanatic! ), but I have to say my heart is in my batch brewing because it’s more forgiving of my busy days. If you are interested in continuous brew, this is the crock I use, with this lid. Would you like me to personally teach you my quick and easy kombucha system? My new ecourse, Kombucha Made Easy, walks you through step by step–doors open April, 2018–get in now! If you already make kombucha, tell us which brewing system you use, and why? Introducing the perfect start to the day, for busy mamas, picky toddlers, even husbands who hate healthy-anything! 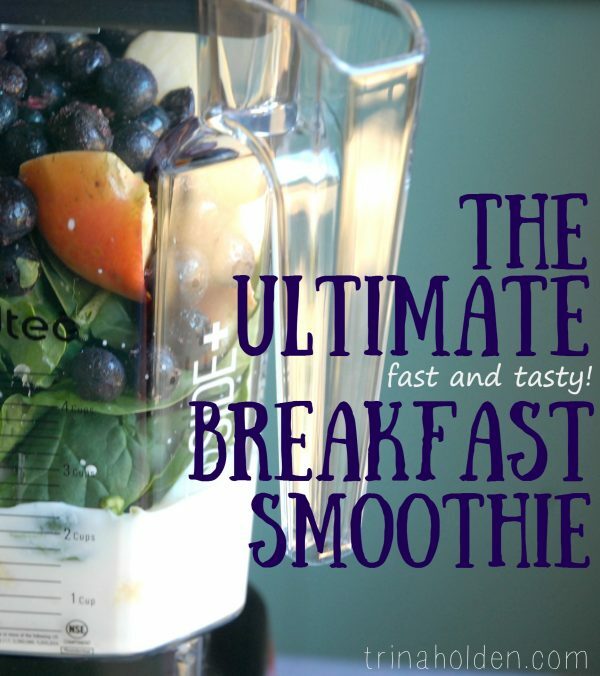 It’s the Ultimate Breakfast Smoothie. Tasty, fast, and a nourishing balance of all the things you need to start your day right. If you’re looking for one thing to do for your family’s health in the new year (and I’m all about one. thing. at. a. time, dontchaknow) a morning smoothie is my top recommendation. It starts your day with deep, balanced nutrition, which can help combat cravings and blood sugar crashes for the rest of the day! But not just any old smoothie will do. Fat–one of our body’s favorite fuels, blood sugar regulator, brain food and what our hormone system runs on. Without this, your smoothie will hit your blood stream too fast and you’re headed for a crash. I use coconut oil. Protein–our body’s cleanest burning food (no waste! no weight gain!) will give you long-term energy. A smoothie minus protein has no staying power. Egg yolks are a great source of protein! Probiotics–help us digest our food, fight off infection, and get the most out of all that other goodness. We need probiotics to help us actually turn our food into fuel–don’t skip this! I recommend milk kefir or whole fat yogurt. Here’s the smoothie my family enjoys regularly. It’s thick, sweet enough for my kids and husband to crave, and doesn’t have any weird flavors or textures to turn them off. 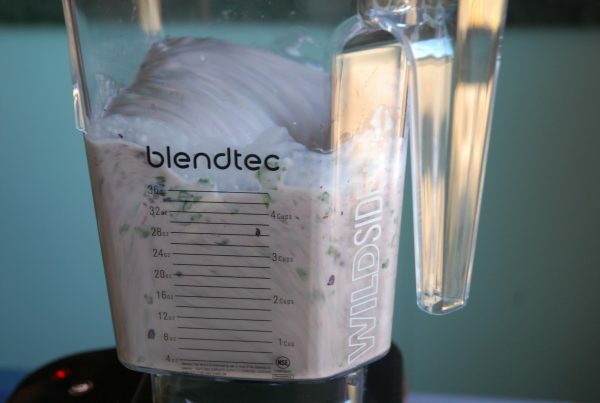 layer the ingredients in your blender with the wet on the bottom, chunky or frozen on top. If all your fruit is frozen, you may want to add a cup of water to help the smoothie to be drinkable. If your fruit is mostly fresh, you'll want to add the ice to make sure your smoothie is nice and chilled. Start blender on low until the ice chunks and frozen fruit have gotten diced a bit, then speed it up to high to finish blending the finer ingredients. I make this first thing in the morning, to give everyone some quick fuel while we finish making our real breakfast. For those with slower metabolism, a rich smoothie like this may be all you need, but for my kids and I, it functions as an appetizer to scrambled eggs or hot oatmeal. I hand a glass to my husband as he goes out the door to work. He says he likes this smoothie because it’s yummy, but actually gives him some solid fuel. If we don’t start the day with this smoothie, it shows up as a mid-morning or afternoon snack. We serve it in sturdy glass tumblers or mugs to reduce spills, and love these fat smoothie straws for easy sipping. Use egg yolks for protein. Unlike protein powder, you can’t taste or ‘feel’ the egg yolk, and it’s way cheaper and less processed than powder mixes. If you’re worried about salmonella, then buy free-range eggs (and read this, it will totally set your mind at ease). Don’t use the egg whites. While yolks are easier to digest and more nutritious raw, it’s the opposite for the whites. Toss them or save them to include in your scrambled eggs or baking. 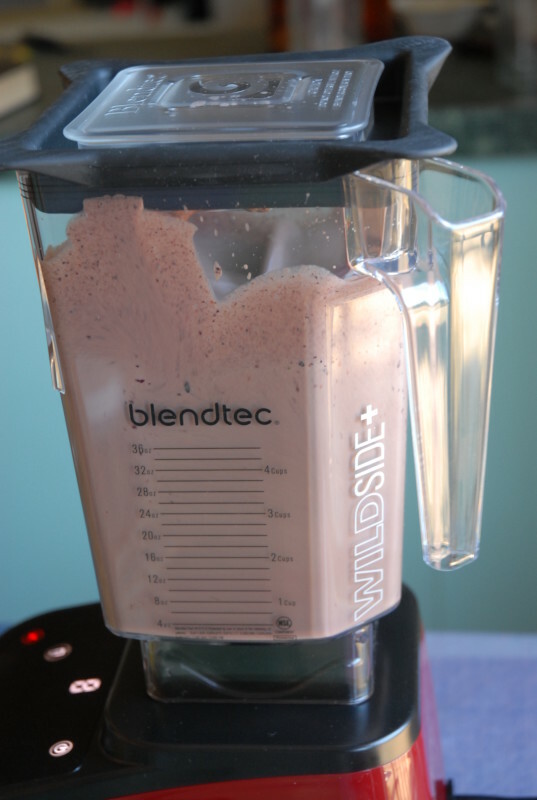 Clean the blender right away–it’s no fun coming back to dried smoothie gunk. Add a few cups of hot water and a squirt of soap and blend on high for a half a minute, then rinse. Wha-laa! Make Smoothie Bags. We freeze peeled bananas our selves, then buy frozen fruit from Aldi and I combine all of it in large ziplock bags in the ratio we like (half bananas, half other stuff) so I only have to grab one bag from the freezer when it’s time to blend. Learn to make your own yogurt or kefir so you always have plenty on hand for smoothies! The great thing about smoothies is that I bet you already know how to make one—this isn’t a huge, hairy, scary idea. All you need to do to create a super smoothie habit is to tweak your smoothie to contain fat, protein, and probiotics. Make this smoothie a habit in 2016 and jump start your family’s health goals! Here at Kitchenwise, I’m all about simple strategies for feeding your family well. It’s not healthy for you or your family when you’re stressed about making the next meal, and good food won’t happen unless you have smart systems in your kitchen. I share the simplest ways to make good food so you, too, can become Kitchenwise. Sign up here for my best tips!